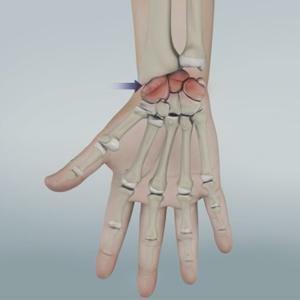 The wrist joint is comprised of eight carpal bones that join the radius and ulna, the two forearm bones. Traumatic injuries, fractures and joint dislocations in the wrist make you more susceptible to developing arthritis. Osteoarthritis: Also called degenerative joint disease, osteoarthritis is the most common type of arthritis that occurs due to wear-and-tear that is associated with the aging process. Rheumatoid Arthritis: This is an auto-immune disease in which the body’s immune system attacks healthy joints, tissues and organs. Occurring most often in women, it inflames the synovium. Rheumatoid arthritis most commonly affects the small joints of the hands and wrists, and tends to be symmetrical (affecting the same joint on either side of the body, at the same time and with the same symptoms). It usually affects the joint of between the radius and ulna. Post-traumatic Arthritis: Arthritis developing after an injury to the wrist is called post-traumatic wrist arthritis. The condition may develop years after trauma such as a fracture, severe sprain or ligament tears. Nonsurgical treatment methods for relieving pain in an arthritic joint include activity modification, NSAIDs, use of splints and steroid injections. Proximal Row Carpectomy: This involves the removal of three carpal bones to relieve pain and allow partial wrist motion. Arthroplasty: In this procedure, your surgeon removes the affected joint and replaces it with artificial implants. Arthrodesis: A fusion, also called an arthrodesis involves removal of the damaged regions of the bones of the wrist and fusing the bones together, using metal wires or screws for support. Fusion can be partial, retaining some amount of wrist movement, or complete where all eight carpal bones as well as the forearm bones are fused, eliminating any kind of movement at the wrist, but not affecting forearms rotation.